Looking for a budget ski holiday this year? Why not try Chatel, in the giant Portes du Soleil ski area of France and Switzerland. The resort is close to Geneva Airport (great for budget flights with Easyjet), and is also one of the first resorts you reach when driving from Calais. With the greatly improved pound-to-euro exchange rate (and assuming it doesn’t change too much during the winter), in-resort prices will be between a fifth and quarter cheaper than they were last winter. 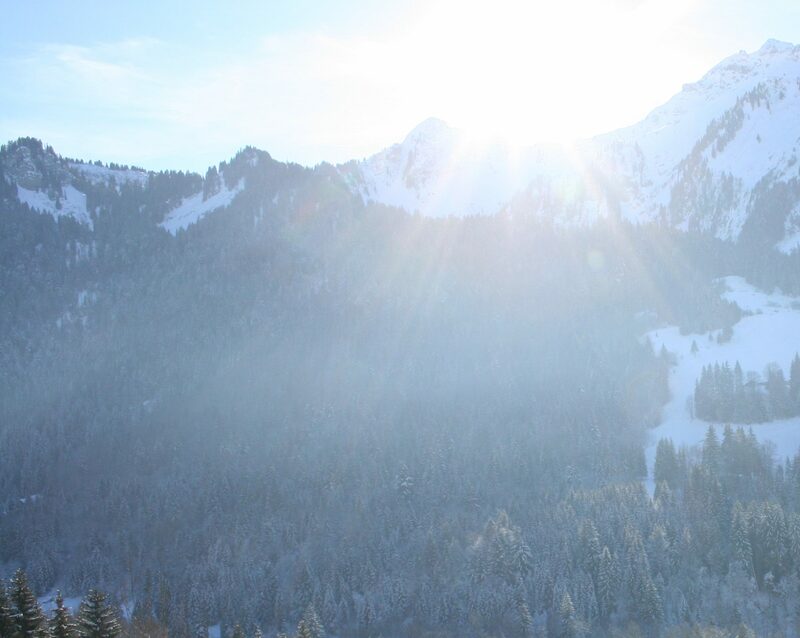 What’s more, the Chatel tourist office is offering 10% off either a local-area Chatel lift pass (valid 3 days or more) or a Portes du Soleil lift pass (valid 5 days or more) if you book online before the 9th December 2012. 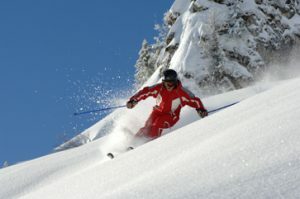 Visit Chatel.com for more information. We also have lots of budget apartments to rent in this ever popular resort – plenty of studios and 1-2 bedroom apartments which won’t break the bank! Follow this link to view our self catered apartments in Chatel. How often have you actually ridden your mountain bike down a mountain? If you mostly ride in the UK, then chances are you don’t do it very often. However, this sport that we all know and love is called “mountain biking” for a reason. If you sit at the top of a mountain pass in the French Alps, looking across towards the snow capped mountains and glaciers of the Mont Blanc range, with 1500m descent of twisty technical single track ahead of you; suddenly it all starts to make sense. The Portes du Soleil region, in the northern French Alps, has become a Mecca for mountain biking and not without good reason. In winter the area is famous for being the largest linked ski area in the world, but during the summer months it is also easily the largest lift served mountain bike trail area in the world. The area really does have something to offer all styles and levels of mountain biking. For cross country riders, there are plenty of demanding climbs to challenge your fitness. For downhill riders, there are well over 20 dedicated downhill tracks ranging from easy to insane. For free riders, the area really comes into its own with mile after mile of varied terrain including bike parks, technical forest single track, exposed steep faces and north shore style courses. In response to the growing demand from mountain bikers from all disciplines, many of the resorts in the area have invested heavily in mountain bike infrastructure. In Switzerland, the combined areas of Champéry, Val d’Illiez-Les Crosets-Champoussin & Morgins boast a four cross track, a north shore zone, a bike park, 3 downhill courses (including the infamous UCI world cup downhill course, and the UCI 15 km cross country loop. In Les Gets over in the French side, there is a beginners’ downhill track at the Grand Cry Park and 2 beginners’ MTB parks; the Kid’Zone and Mini Jump Park. For the more experienced there is a dirt and freestyle jump park, a four cross track, a freeride zone in “Gibannaz Canyon”, 4 downhill courses, and 6 cross-country suitable for all riders. Chatel, which is right at the centre of the area, has perhaps the biggest selection of purpose built MTB areas with 15 MTB tracks (14 of which are downhill profiled), 5 north shore zones, 1 four cross track, the infamous freeride “La Face” mountain style zone, 1 kid’s cross and a drop zone with jump pit, wall ride, quarter, step-ups and step-downs. Despite having great trails for intermediate, advanced and crazy riders, the Portes du Soleil area is also a fantastic place to learn mountain biking, or to go riding with young families. There are lots of opportunities to get chairlifts up to the tops of the mountains, and then find your way around on 4×4 tracks which don’t tend to be too steep or challenging. One of the reasons why the Portes du Soleil has become so popular for mountain biking is because the sheer vastness of the area results an incredible mix of varied terrain, and ensures that the trails never become too busy. Indeed, it is possible to ride all day and not see another person. Couple this with picturesque resorts, great value accommodation and the glorious back drop of the Dents du Midi and Dents Blanches mountains, and it is clear to see why the Portes du Soleil is one of the best mountain biking destinations in the world. The Passportes du Soleil is an epic mountain bike race in the huge Portes du Soleil region of France & Switzerland which heralds the start of summer and the opening of the lift system. It takes place over the last weekend in June, and has evolved from an earlier event known as the “Freeraid”. Most riders don’t really treat the Passportes as a race (although you do get a number for the front of your bike) but simply a great day’s mountain bike riding. The event is massive – 2 days, 3 courses (30, 45 & 75 km) and 3700 riders. The classic trek of 75 km includes 12 ski lifts, 6500 m of total downhill, 500 m of total uphill climb. What makes this event unique is the fact that it attracts a wide range of participants – from lycra clad cross country riders to armour clad downhill riders, and from beginners to experts. Everyone gets involved and rides the same course. True, the cross country riders tend to beat the downhill riders on the climbs, and for the real keen peddlers, there is also optional climbing sections. And true the downhillers tend to overtake the cross country riders when it comes to descending, and there are a couple of optional “free ride” sections. But overall, the race is a fantastic melting pot of all mountain bike styles and standards. As for the course itself – it has to be one of the best in the world! It takes in some amazing panoramas on the Morgins and Champoussin sections with views of the Dents du Midi, the Dents Blanch and even Mont Blanc. There is some excellent steep and twisty single track down through the woods in Torgon. 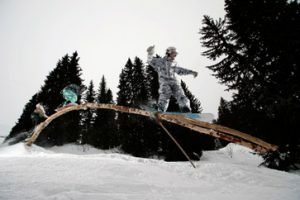 There are dedicated downhill courses used at Chatel and Les Gets. There is an epic descent from the top of Linderets down to Morzine and there are some great meandering cross-country sections on relatively easy 4×4 tracks. Another excellent feature of this event are the fantastic refreshment stands located at regular intervals throughout the course. Large tables offer up a wide range of snacks and drinks, from energy/nut bars to cheese and ham, from energy drinks to beer and wine. It is always interesting to see who feels fit to tuck into the alcoholic drinks at ten in the morning, and then avoid them if you see them on the course! The Passporte du Soleil is really an event for everyone. It has become so massive that it now sells out months in advance. However, if you visit the Portes du Soleil later on in the summer, it is possible to get a map from the local tourist office and cycle pretty much the whole route. * 4000m of total downhill /300m of total uphill. 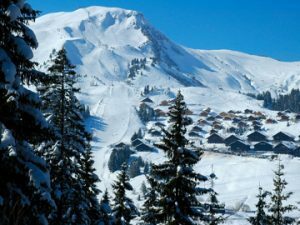 * 4 resorts to start from: Châtel, Champéry, Morgins et Torgon. For more information, visit the Passportes du Soleil website.